Little strawberries? Where? What? How? My husband and I were in the middle of a walking trail in Champoussin, Switzerland and I couldn't understand where the strawberries could possibly come from. At 1,600 meters high and in the middle of a walking trail, we were undeniably away from anything bearing strawberries nor any shop selling them. Then I saw minute red dots hidden among the vegetation on the inclined right side of the mountain. Can those be the strawberries he got all excited about? They're too small to be strawberries. But, hold on. He did say fragol-ine. Any Italian word attached with the suffixes ine, ini, ina or ino means on a smaller scale. Strawberries are fragole. He excitedly took some with our dog excitedly prancing after him. Then he made me try one. Wow! Goodness! And I never knew they existed before. 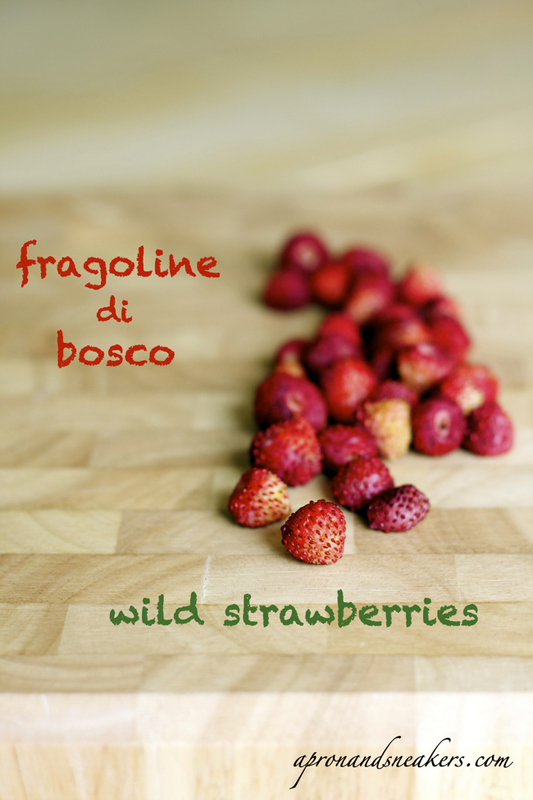 He explained to me that they are fragoline di bosco (wild strawberries) and they never get bigger than that. It was my initiation to this amazing fruit. When I looked better at the side of the mountain, it was completely full. Quick thinking told me to go through our backpack for plastic bags to harvest all those red jewels that were right in front of us. We were able to fill up two plastic bags of fragoline and we excitedly headed back to our rented chalet, our walk completely forgotten, with our dog following us back half heartedly. Following my husband's suggestion, I sprinkled them with sugar and scattered them on top of scoops of vanilla ice cream. I prepared them like how I prepared the berries the previous day. Gelato alla vaniglia con frutti di bosco (vanilla ice cream with berries), simply one of the best desserts that exist and it doesn't even require effort to make. We both took our ice cream bowls to the balcony, and just enjoyed the spectacular Dents du Midi mountain in front of us with our dog sleeping contentedly beside us. It was so beautiful and peaceful that it was so surreal. Life should always be like this. That was then, without kids yet. The fragoline come out at the end of June and if you are lucky, until the first week of July at the Italian & Swiss Alps. I'm quite certain about this because after that discovery, we timed our summer trips to the Swiss & Italian Alps at that period to reach the season. I never saw them for sale in the markets but they are sometimes available mixed along with other berries as toppings of vanilla ice cream at the mountain shelters. 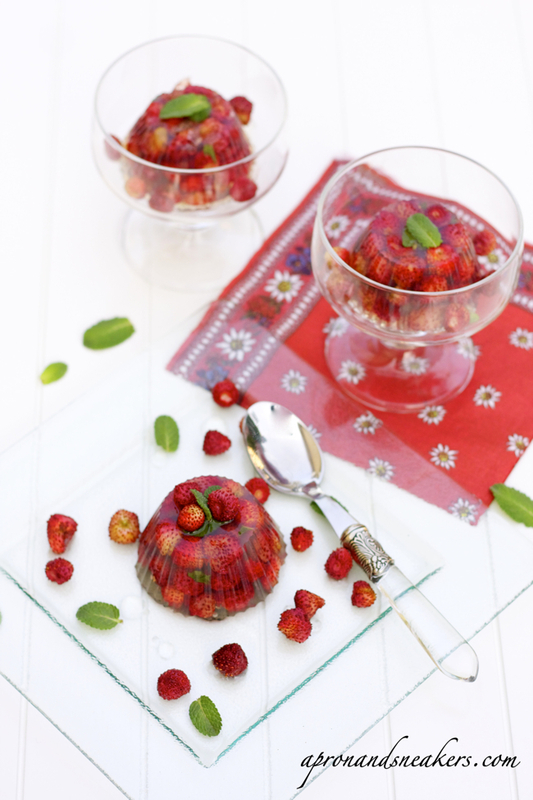 There is a town in Lazio called Nemi, that's close to Rome that produces these wild strawberries. They are grown on the sides of the volcanic crater, which creates a micro climate that retains the warmth of the sun, thus making the flavour very intense. Refer to this link to go to the old post I wrote about Nemi and the wild strawberry & basil risotto I made. Other than that, they pretty much don't exist in the markets. So think how excited I got when I saw them the other day in a market at the center of the city? Aside from getting so excited myself, I thought of how my kids would love having them. We were able to keep a couple of plants stay alive at home for 4 years now but they have a meager production of 2 - 3 fragoline a week continuously, following no season. I got this idea from Chef Monica Bianchessi of the show Pronto in Tavola. There are not so many recipes using fragoline so when I saw this one, I immediately took note of it. This seemed like a simple and delicious dessert. 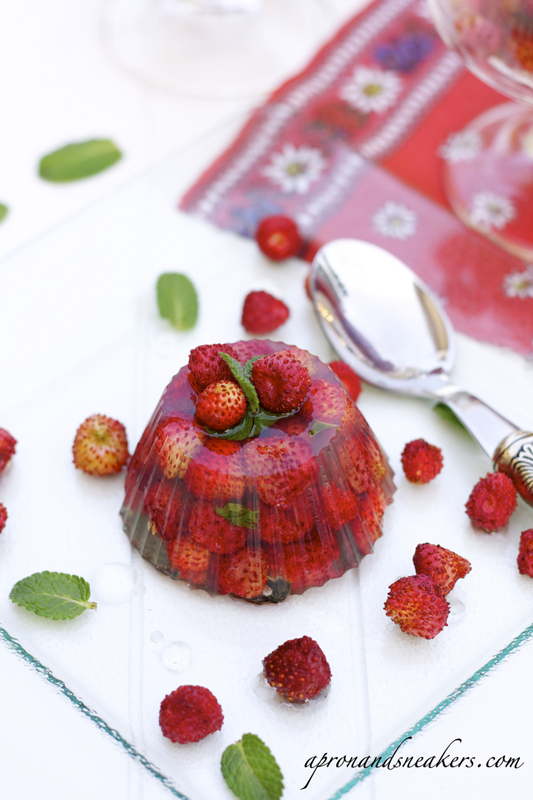 How can you go wrong with gelatin prosecco and wild strawberries? This dessert is delicious and refreshing. The prosecco jelly didn't take away the attention from the fragoline. It blended well with the fruit and added a bit of sweetness. I added the elderflower syrup from the original recipe. I'm glad that I did because it wrapped up the whole dessert with a fresh floral taste and smell. Feel free to take it away from the recipe or replace it with something else. Combine prosecco and sugar in a small saucepan. Let the mixture boil and simmer for about 15 minutes or until the alcohol has evaporated. You can also adjust the sweetness at this point. Add agar-agar. Whisk well. Cook for another 2 - 3 minutes. Turn off fire. 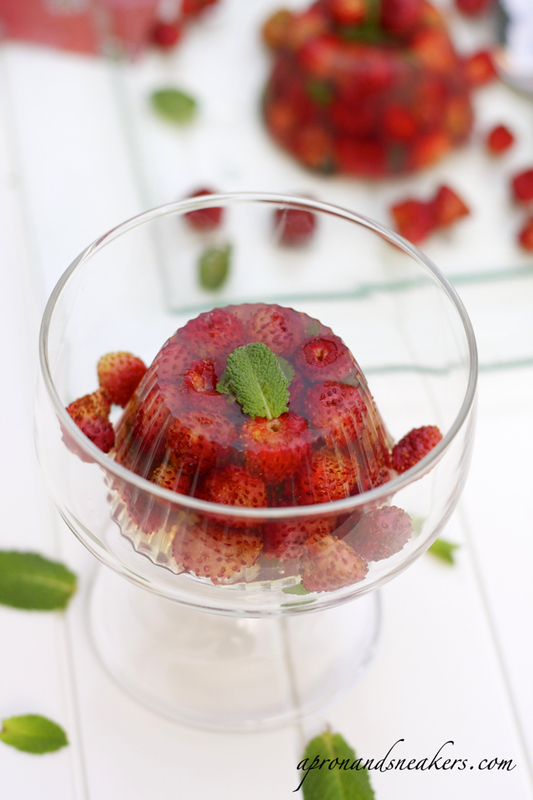 In the muffin molds, put 1 small mint leaf at the center in each mold, followed by the strawberries & torn mint leaves. 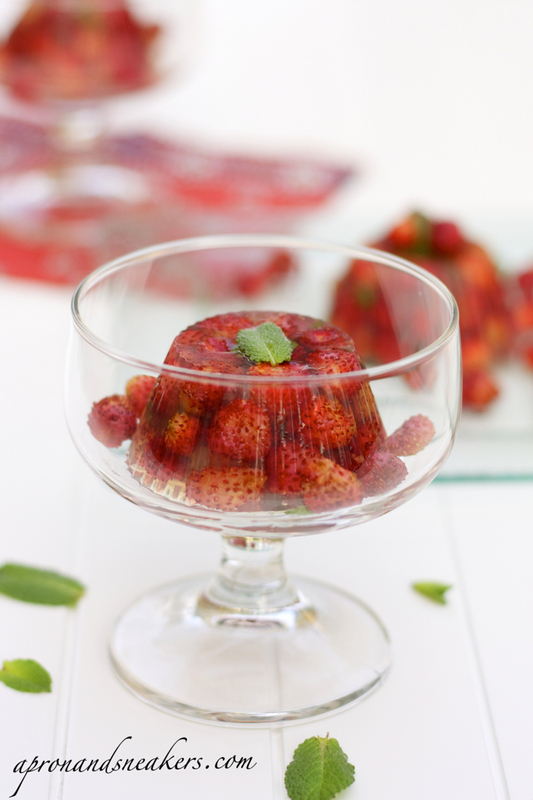 Fill up each muffin mold with strawberries until the rim. Make them compact by pressing very lightly. Pour prosecco mixture in each mold until the rim. Give it a little shake and time to make sure that there are no empty spaces inside. 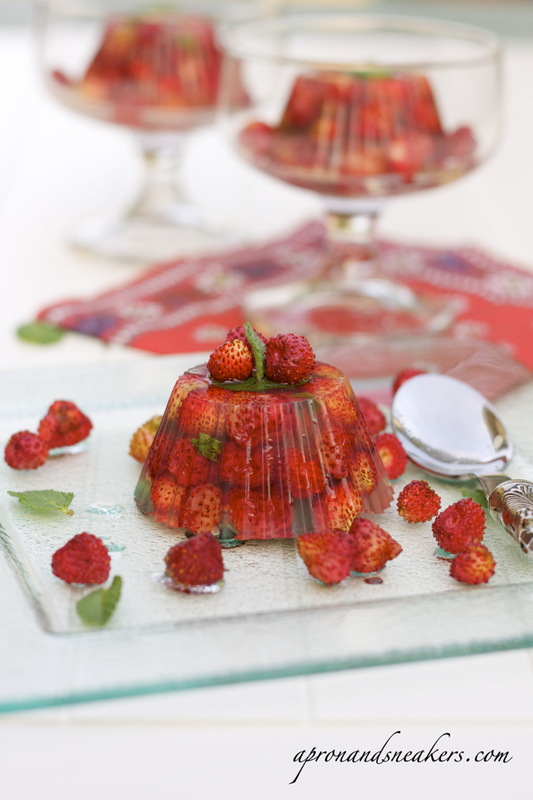 Drizzle with 2 tablespoons elderberry syrup on top of each jelly before serving.